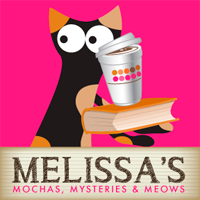 We're excited to be joining in this fun blog hop hosted by Miss Molly Says and Mom Does Reviews. 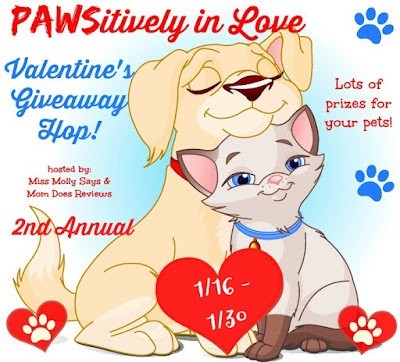 Each blogger participating in the hop has been asked to give away pet-related gifts. Since Valentine's Day is all about spending quality time with the ones we love, we're giving away this super cute paw-shaped light pointer toy, fun for both you and your cat. Featuring two modes, steady-on and blinking, what's really pawsome is that you don't need to keep your finger on the button. 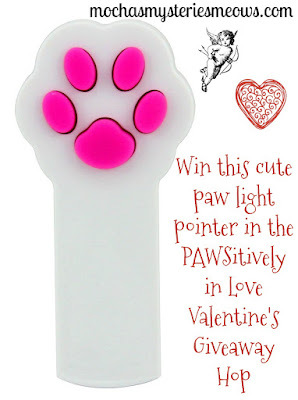 Press the paw once and the LED light will blink, press the paw a second time and the light is steady. Press the paw a third time will turn the LED light off. Plus, the small pink silica gel buttons make pressing the buttons more comfortable. My human's dad's cat, Smokey is the biggest red dot fan! She could play with it for hours! Which is the opposite of Binga, who ignores it! Oh my goodness, my boy Evan would be in love with this. Not to mention that it's adorable! 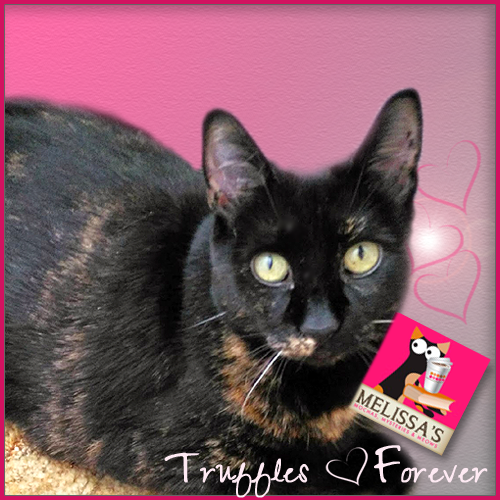 Thank you for the chance to win this pawesome prize, Mudpie and Melissa! I haven't tried the red dot out on our cats in a while, but Paisley was fairly obsessed with it when she was a little younger. She does like to try to catch light reflections, so I think she'd still be interested in the dot! My kitty-boy has always loved chasing the red dot! Both of our cats Ozzy and Buddy love it when we play the chase the red lite around on the floor. Eli and Toby love the red dot game. 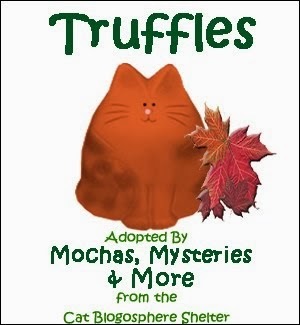 This would be for my aunt and uncle's cat; she loves this kind of stuff! Most definitely. The red dot is just asking for it. I don't have a cat, but my mom does. They love playing with all kinds of toys. Yes the cat does love the pointer. Our cats used to love playing with the laser light. We always end up losing them though. The light, not the cat! I've never had a laser light so I don't know if the kitties would chase the light. I'd sure like to win so I could try one. I just adopted two kittens and I haven't tried a laser with them yet. I'm sure they would love to play with the light. I love that little red dot! 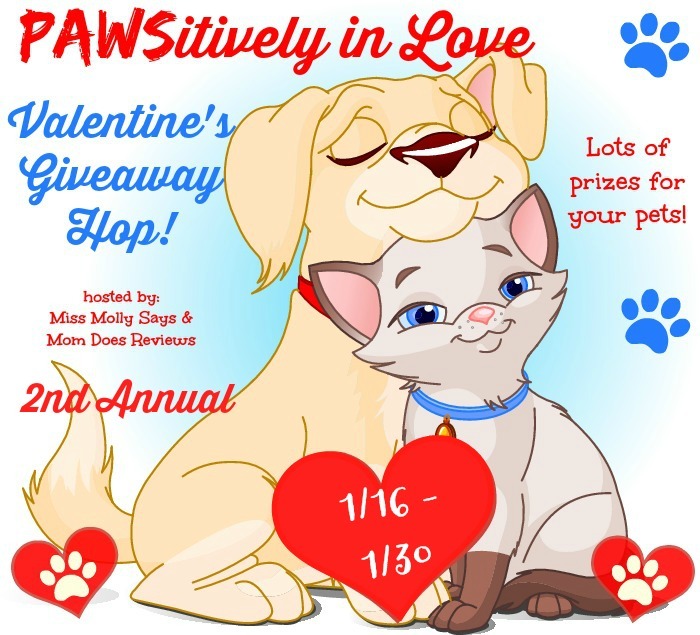 That is a great giveaway! Saphira loves playing with the red dot. I lost her laser pointer. She needs another one. My kitty loves it! I like to make it "hide" under her paw. Its the cutest thing. Lexy LOVES the red dot!!! This one is so cute! Yes. Mr. B goes crazy when I get the laser out. My 4 will crash into each other chasing the laser pointer until my hand wears out. I've had some cats that just watched from a distance, but most love it. Yes!! She has a blast with it! Thank you for the giveaway! My cat would love this and so would my son. My cat loves chasing light and that red dot. i don't have a cat, but my sister does. cupcake goes nuts for the red light! it's pretty funny to watch. My cat Juliet loves to go after that elusive red light,my husband plays the red light game with her while the rest of us crack up watching. My cat, Misty, is a fan of the red dot. She'll chase it for quite some time. Thanks. George and Baby will love this! 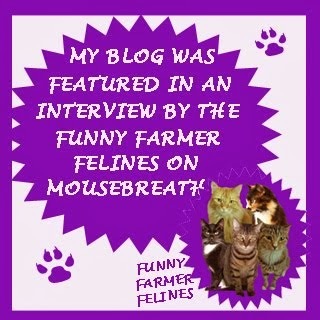 OMC, how cute is that pointer! All three of our cats love the red dot, but Olive goes crazy for it! 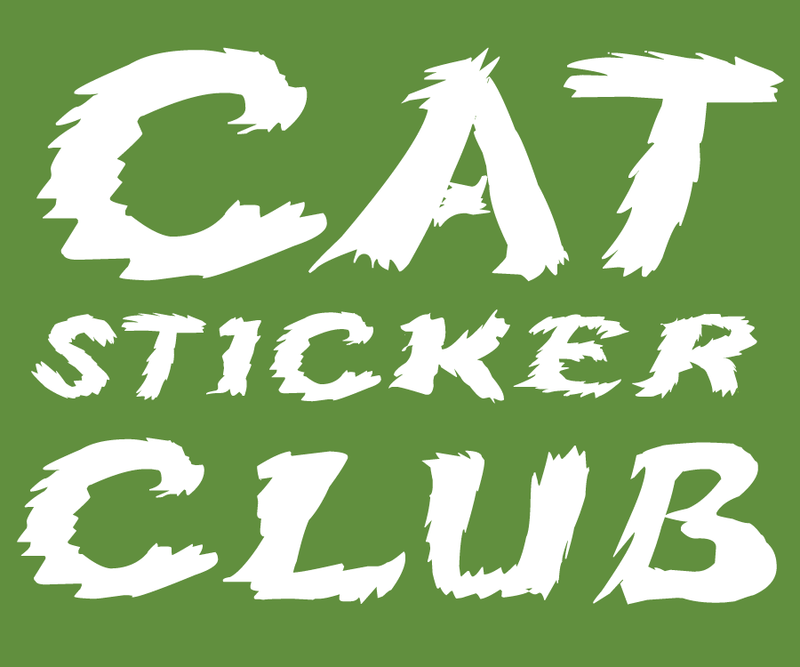 i dont have cats but would love this to donate to safe haven for cats. i know my dogs love to play with things like this though. Don't have a cat, but my dogs love the red dot! Oh my gosh yes!!!! She loves it so much! The cat.... the dog.... the kids.... heck we have just as much fun laughing at them all chasing it as they do chasing it! Yes they love the laser pointer! OMG yes. She's so totally into it. We have to stop just after a few minutes tho so she can catch her breath. She loves it! My dogs end up chasing it at the same time too. My daughter's cat turns all kind of flips after it! Don't get in the way of the light here, they will run over you, yes they enjoy. Not only Yoshi kitty but Artie dog does too. All three of them love the red dot! Our cat isn't very playful, but she LOVES chasing the red dot! Yes, they all do. I have 12 elderly rescue cats. My daughter's families 3 cats love playing with it! 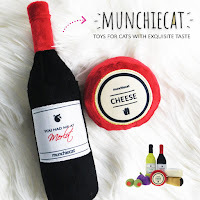 I think my cat would love it! My cat loves it! She also loves chasing the flashlight! I don't know....I've never tried it with him. But I bet he would like it! My cats could care less about a laser pointer but my dog loves a laser pointer! Yes, and so do my dogs! she likes playing with the red dot far too much! :) the baby started to copy the cat as soon as she could crawl. Fun times!! She gets mad at it. Lol! Yes, our cat loves chasing the red dot! We always have another toy there that he can physically play with too. Yes- they're all really obsessive about it. We have three cats. My old girl, Moko, has never been interested in the red dot - or even toys. The other two - Arata and Kotoha - just love chasing the dot. Especially Arata. I lost my deaf hound girl, Ran, nearly two years ago - she loved chasing the red dot on the driveway in the evening. I've never seen a dog who loved it as much as she did, except for maybe my youngest daughter's dog, Riley. My cats are huge fans of that crazy red dot! Yes. Both of our cats love chasing after the red dot! My cats like playing with anything. Very playful pets. My cat lovesss the red dot!! !